Check out this comfy gladiator sandal. Has a built-in cushiony leather footbed. The enclosed vamp prevents slippage and still lets the world see your new pedicure! Also comes in brown and black. 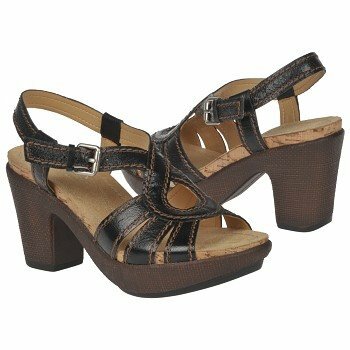 2 1/4″ heel wedge sandal designed to offload the ball of the foot. 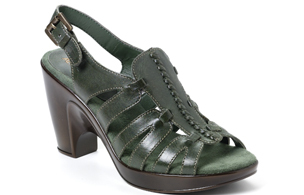 A great shoe for longer periods of standing when you need a cute sandal! 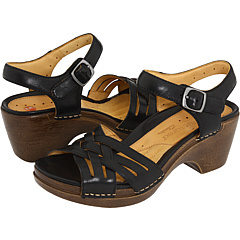 Here is a nice sandal by Naturalizer. It has a cozy liner combined with a rocker forefoot and stable shank; all of this makes for a good recipe!